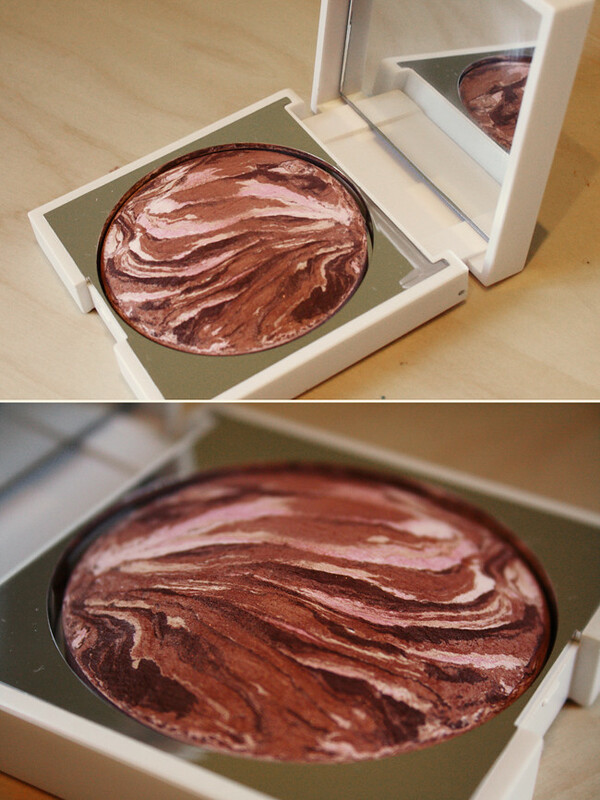 Another New Cid item to add to the collection and this time it’s in the form of this beautiful marbled bronzer. The product features swirls of bronze, golds, pinks and chocolate browns which makes it perfect for all skin types. I actually really like the simplicity of the packaging, but I can see the white maybe getting a little dirty~ with it being a bronzer. The compact comes with a mirror in the lid and around the 9g of product which is a big bonus for me. I’ve always been a little on the fence when it comes to marbled products, I think they look very pretty and create a nice design but I do often find they just merge in to one colour which doesn’t always look great. But having used this product a few times now, the overall colour is a really nice light brown and can be very easily built up for a more bronzed~ look. I am a little disappointed that the pink doesn’t come through as much as I would have liked, but you can still tell there is pink in the product which is good. There is a slight shimmer to the product, but it’s certainly not over the top. This compact could again could be a little pricey for some but I think the fact you’re getting a lot of product makes it value for money. I think it’s worth investing in at least one high end blusher/bronzer because it’s something that can really make your make up, I think so anyway! I do like this product and I will be using it every now and again, but I think I’d rather get the Shimmer palette next time as it’s probably more me. If you’re interested in seeing how the bronzer looks I’ll be wearing it for this weeks Fridays Face so check back then! The marbling on this is gorgeous! Think I would want to just look at this instead of use it haha. I love the look of this, quite expensive though as you said! I quite like the packaging, very simple. P.S. Love the snowflakes on your blog, so cute!